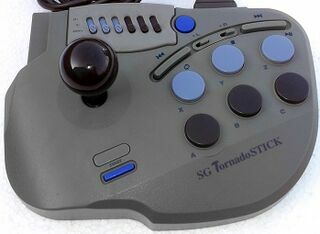 The SG Tornado Stick is a third-party Sega Saturn arcade stick released by Imagineer in Japan. The SG Tornado Stick is a stripped down version of the Eclipse Stick seen elsewhere in the world, with many of the turbo features removed. It is unknown whether other regions of the world received the SG Tornado Stick (or whether Japan officially received the Eclipse Stick). The SG Tornado Stick also uses a lighter shade of grey for its case. A similar story befalls its control pad counterpart, the SG Tornado Pad.